As I sit here I am in awe and shock of the kindness and support of some of the companies around me that I love the most! Some of you have noticed that I have recently been featured on Sephora's front page as well as Urban Decay's front page. I feel beyond honored since I frequent both those sites on a regular basis. All I can say is thank you, thank you, thank you! Since I know these won't be up on their homepages forever (I wish! LOL!) I made these screencaps which you can click to see bigger. This one is on sephora.com. If you'd like to see the original blog post with pics, click here. 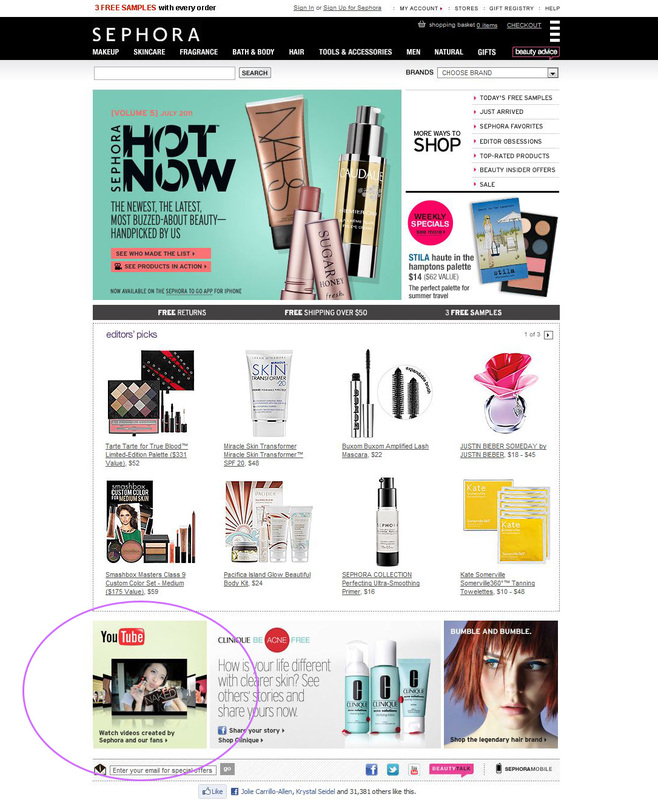 And here the feature on urbandecay.com (OMG *squeal*) along with one of my favorite youtubers, JulieG713! awww yayy! congrats :) you definitely deserve it. that is so exciting! congratulations!! congratulations! it's great that you get to be featured by such big companies! makes your hard work so much more worth it! Oh congrat honey <3 this is great! That's so awesome! :] Congrats~ your video on the Naked palette was the first one I came across and now...I am a proud owner and follower if frmheadtotoe! By the way, I'm thisssssss close to getting the Lioele automatic eyebrow pencil in grey-black because of your recommendation! Awh you totally deserve it! I am so happy and excited for you!! Congrats! That's so exciting for you! Much deserved, since I'm sure you boosted sales in waves -- you converted me too! Congrats Jen!! i have a question about the Eucerin Sunscreen that you just reviewed. it says it's for sensitive skin but can people with dry or normal skin use it? would it be not as effective? Thanks! It's an honor to be on your post and videos! Do you think you could do some more every day looks using just the Naked Palette?? That would be awesome! Thanks Jen! that's so awesome! congrats!! guess you never know who is watching your videos! could be a big-shot ceo!!! keep up the good work! Congratulation Jen! Becoz of u, I'm now the owner in holding the Naked Palatte and primer of Urban Dacay, also I'm going to buy the R&R blushes... However i cannot buy it in HK store! I'm really loving yr tutorial and yr sharing and you deserve it truly ! Keep on and support! Congrats on the features, Jen! I just received a $50 gift card to Ulta for my birthday, so I bought the Naked palette. I immediately thought of you! I am loving virgin and half-baked. Cannot wait to experiment more! I was wondering if you could do a tutorial for your eyes in your review of the Urban Decay palette? It's a great daytime/work look.